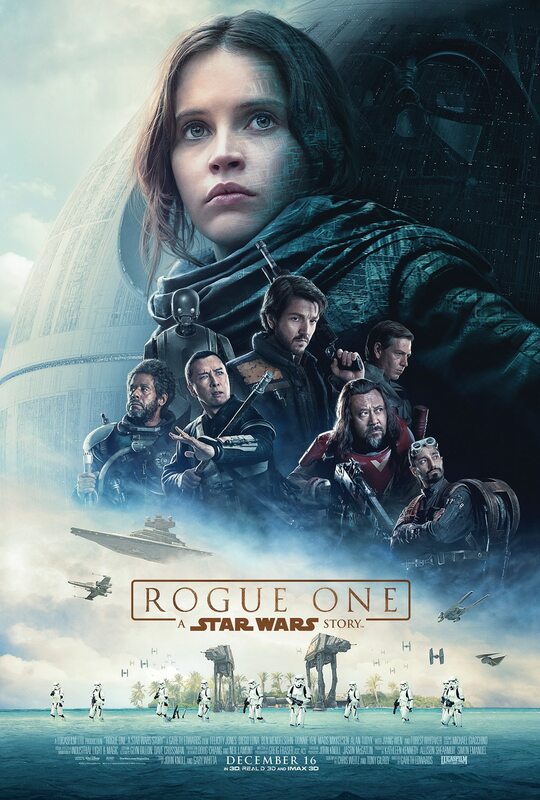 On Thursday (May the fourth be with you) I watched on Blu-Ray Rogue One: A Star Wars Story. I didn't go see it in theaters probably because of my disappointment with Star Wars VII: The Force Awakens which I did see in the theater (IMAX 3-D). But Rogue One was fun. It was fun to be back in the Star Wars universe. And the writers took great pains to A) deliver an action-filled movie and B) not contradict the canon of Star Wars. Small spoiler: this move ends just before Star Wars IV: A New Hope starts. There is one small thing that is inconsistent with Star Wars IV. But we'll let that slide. As far as the movie, it is fun, action-packed, and heartfelt. It was a little disappointing in the end, however as (**Large Spoiler**) everybody dies. Well, except Darth Vader. I don't know why but despite thinking it was fun to revisit the Star Wars universe, the movie is so relentless in its action and its black vs. white plot structure, that I found the movie unfulfilling. There was very little depth to anything. The Empire is bad, the rebels are good, period. I suppose the entire Star War franchise has the same issue but it was more apparent in this movie. The rebels are portrayed as a bit grittier and more diverse than they were in other Star Wars movies. I remember when the only black person in the whole galaxy was Lando. So that's an improvement. There were some slight of hand tricks. Some pieces of film were cut directly out of A New Hope. They probably used CGI to make an actor look like Grand Moff Tarkin but the voice wasn't quite right (except when they copy and pasted it out of A New Hope). And for continuity's sake, to fire the Death Star still involves a 1980's vintage video mixer. While I enjoyed the movie and found it, for the most part, fun. I didn't LOVE it, like I expected to. If you haven't seen it, go ahead, you'll probably enjoy it. But it's not on the level of A New Hope or The Empire Strikes Back.